Welcome to a new feature, In The Hood, where I chronicle some of the eclectic cars seen on the streets of the old money neighborhood where I happen to rent a one-bedroom apartment. This car is the inspiration for In The Hood. Behold, the Mercedes 500E, one of the greatest subtle sedans in the history of time, painted in a color only a German could love. Interestingly, this isn’t the worst color for the 500E. There was also a purple, which occasionally showed up in Mercedes advertisements that convinced people to buy BMWs. The story on the 500E is this: Porsche was going down. Their product line was down to three embarrassingly dated models: the 944, which had come out a decade earlier; the 928, which actually replaced the chariot in ancient Rome; and the 964, which was purchased by people, apparently. Headed for failure, Porsche got a break when Stuttgart neighbor Mercedes came by and asked for help building the 500E. 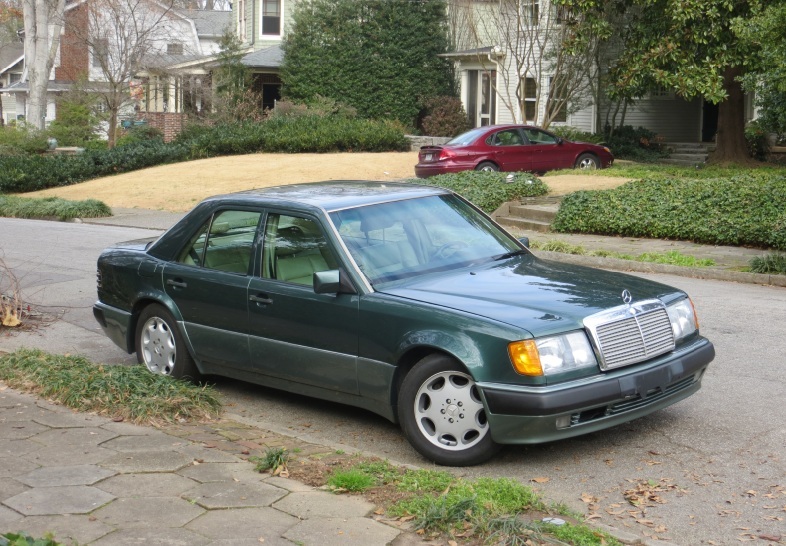 It may look like a normal W124 E-Class, but the 500E used a 5.0-liter V8, which was completely unheard of at the time. The period M5, for instance, used a straight-six, while the engine in Audi’s performance model was unknown since it wouldn’t stop unintendly accelerating long enough for anyone to check. The old story goes that the 500E kept Porsche in business, allowing them to develop the 993 and, eventually, a hatchback whose dimensions roughly resemble the Mayflower. I had a 500E once. Mine was black. This guy’s is green. I would expect nothing less from the unusual daily car show that is my neighborhood. Yeah, I have heard all the assertions that the SLK is a hairstylist’s idea of a sports car. Whenever I park it, women of all ages smile and say “Nice car……” in a manner like the verbal foreplay I recall from about 45 years ago. The trunk holds just one loaf of pumpernickel and maybe a tin of Mothers paste wax but with the top down on a winding road in summer I can relive my sordid youth in Teutonc splendor……. I have the last SLK32 AMG – 2004. I fell in love with the original SLK at 18 when it first came out. If I can swing it, I’d like to keep this car forever. Will always be my favorite Benz. This sedan looks like it has enough hood for a powerful engine, enough trunk for some stuff, and the rest of the space for driver and passenger ease and comfort. No sloping roof, no exaggerated features. Just a quiet, smooth-riding, quality-built rectangular chunk of handsome practical confidence. 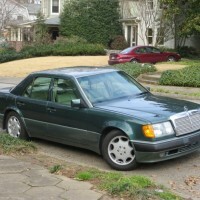 I recently drove a ’93 MB 400E (this car’s less powerful brother) and could not get over how good it was. The interior was beautiful with quality materials that you don’t find in today’s C or E-Class. There were no silly electronic gagets and no fussiness or frills; this was a serious car meant for serious driving. It had that carved from a solid block of granite feel with doors that closed with a distinctive “thunk” that could only come from an older Mercedes. On the road it drove and handled like a car that could have been built yesterday and not twenty years ago. I’m sad that Mercedes doesn’t build cars like this any more. There is not a current Mercedes that I’d rather have over a 400E or 500E.